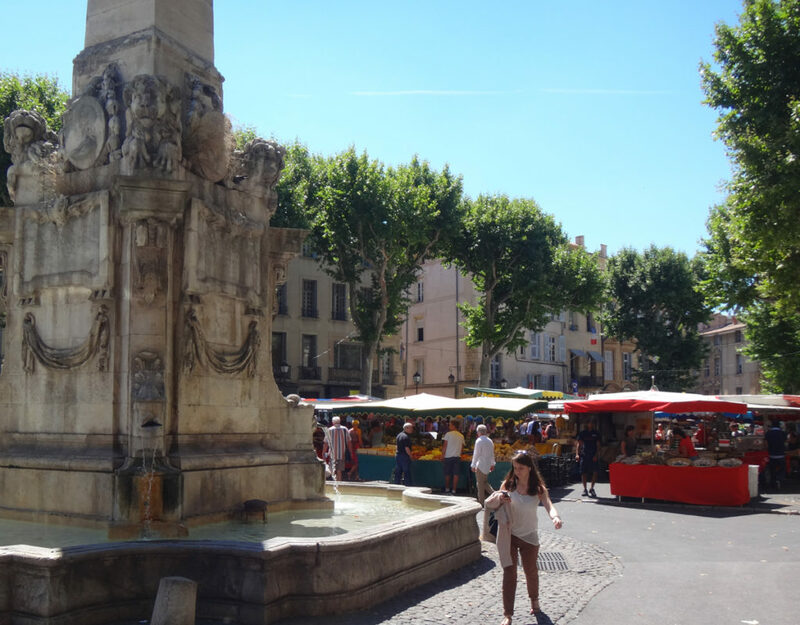 What better way to discover the south of France than by planning our two weeks around the market days of the charming towns and villages scattered one next to the other throughout Provence? 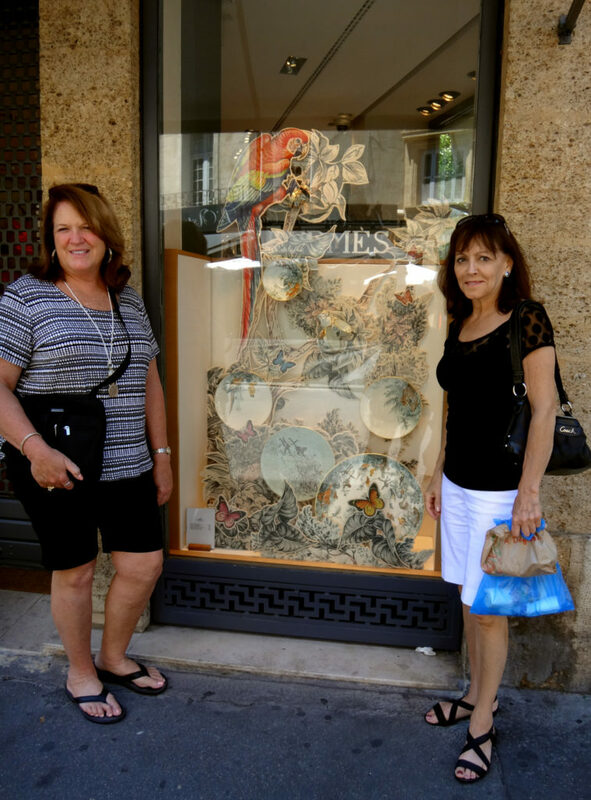 It was Thursday, so it was time to visit Aix-en-Provence (locals call their town “Ace”). 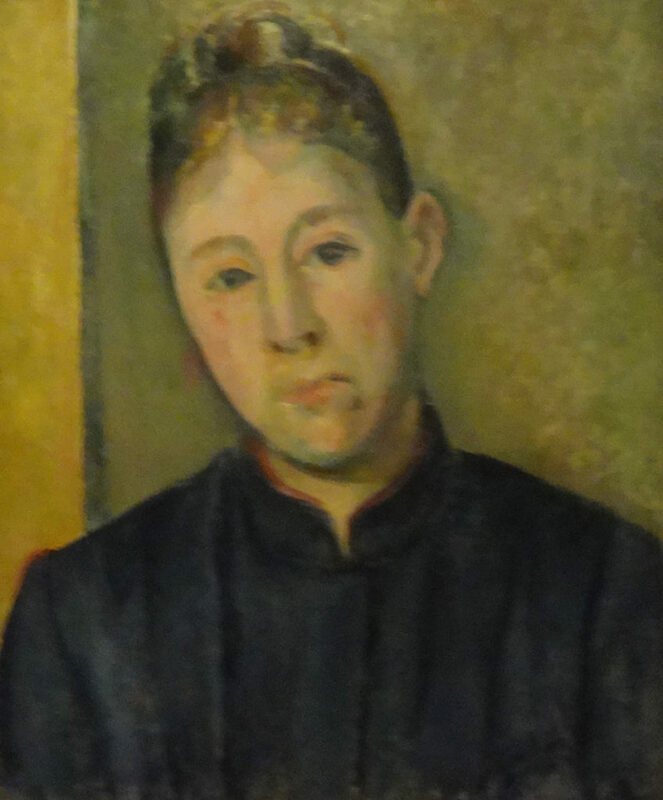 Not only would we get to shop, we’d also get to see where Cezanne hung out, see the local cathedral and visit the “most beautiful tea room” at Caumont. 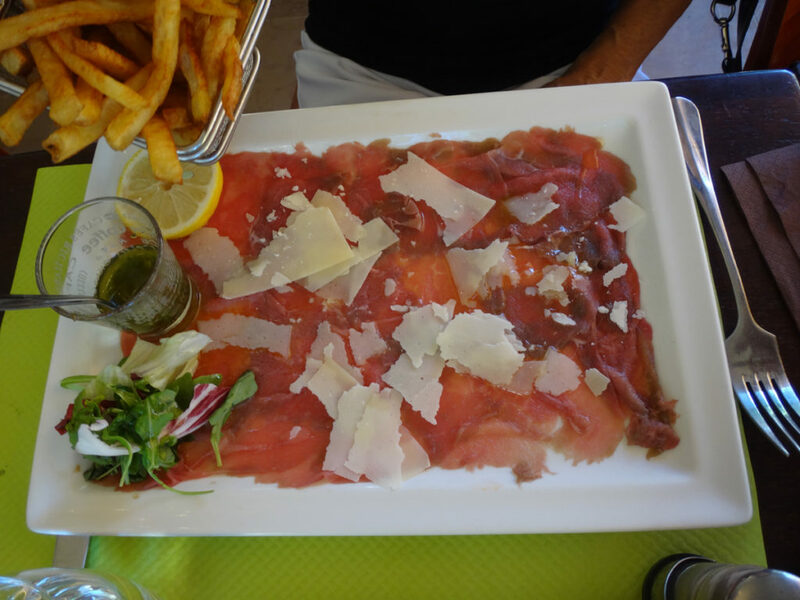 We’d also learn that Aix is so much more than we had expected. As usual, we got turned around and lost as we approached town. 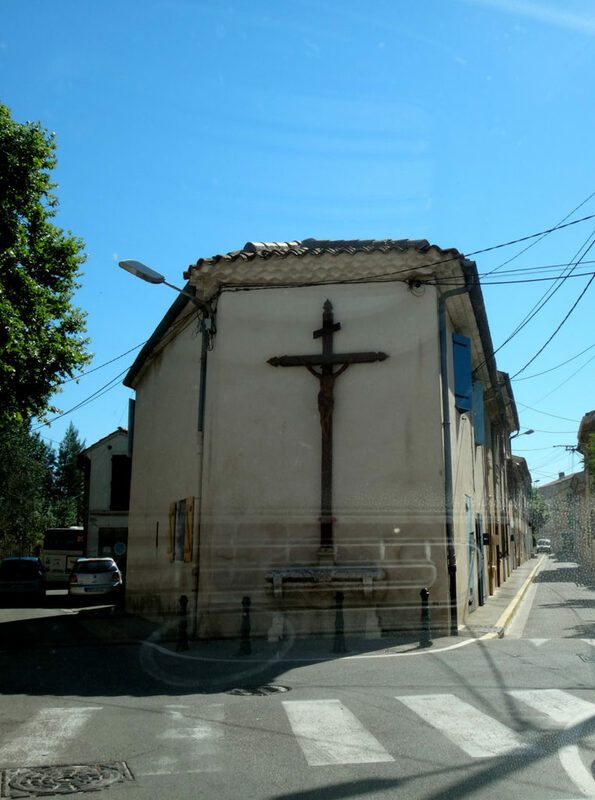 Sometimes we just had a hard time believing our GPS really wanted us to travel left down a tiny little street next to a crucifix attached to a wall in the middle of a road. Go left here…. really? Aix-en-Provence. But we did find our way to the center of the old town. One of the very first things I spotted was a landmarker in the midst of sales booths and vendors’ cars. 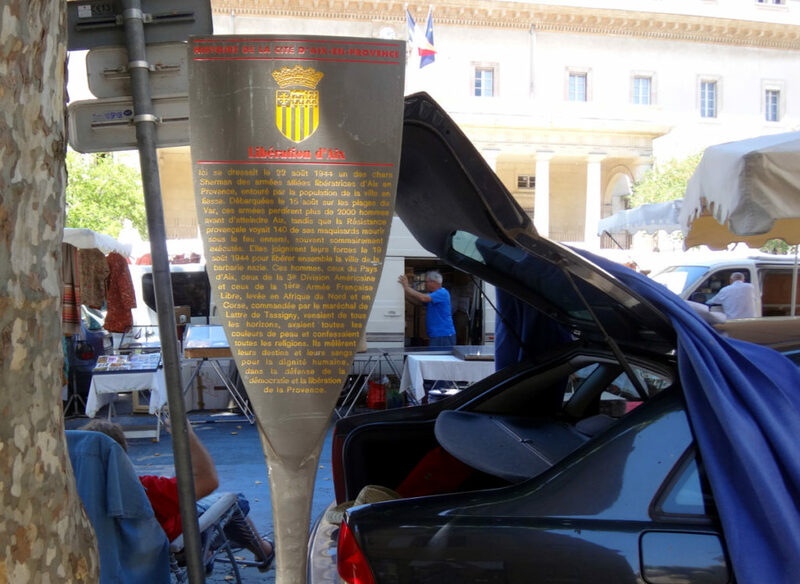 Here stood 22 August 1944 one of Sherman tanks of the armed Allied liberation of Aix in Provence , surrounded by the population of the city in jubilation . 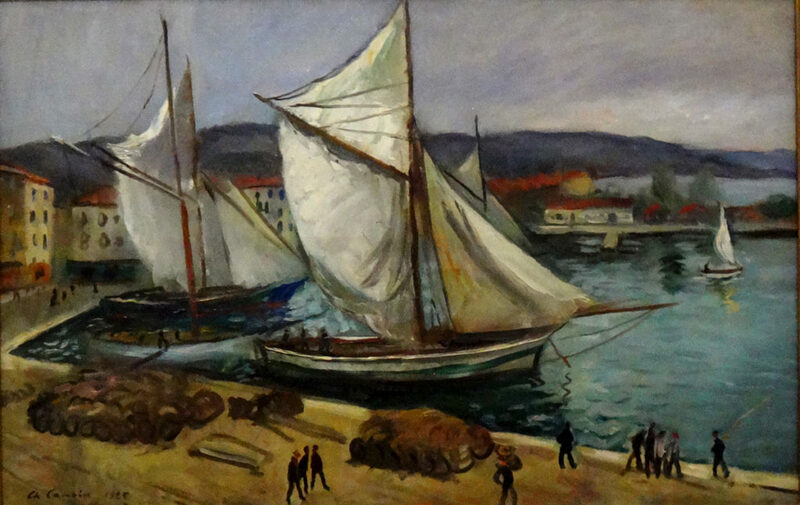 Landed 15 August on the beaches of the Var , the armies lost more than 2,000 men before reaching Aix , while the provencal resistance saw 140 of its guerrillas die under enemy fire, often summarily executed. They joined forces August 19, 1944, to all liberate the city from Nazi barbarism. These men, those of Aix , those of the American 3rd Division , and those of the 1st Armee Francaise Libre, leveed in North Africa and Corsica , commanded by the Marechal de Lattre de Tassigny. These men coming from all walks of life, had all skin colors and all religions. They mingled their destinies and their blood for human dignity in the defense of democracy and the liberation of Provence. This is the beauty of the south of France. Next to a profound statement is the fruit of struggle. People are free to explore the countryside and meet one another thanks to the sacrifice of others. I am grateful. Market day has been held in the same area for centuries. The Romans traded on these very streets before Christ was born. 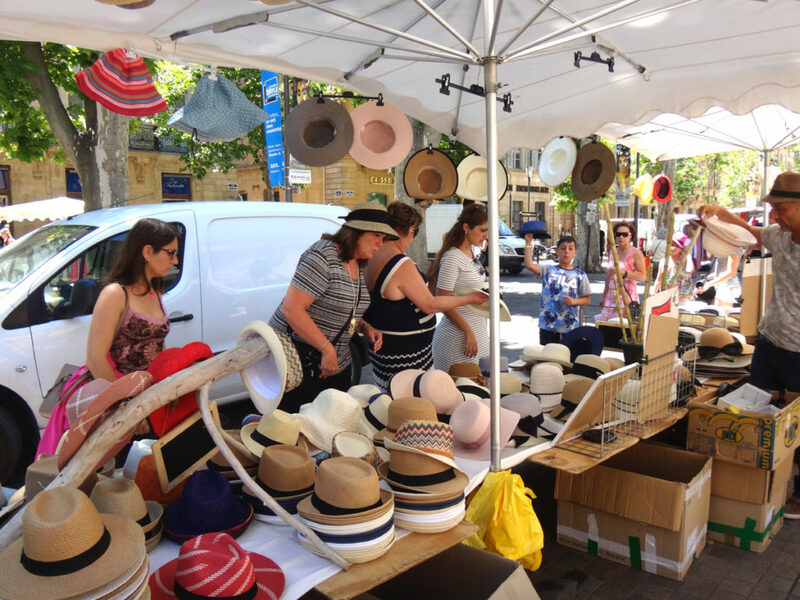 Sunny days call for hats – and the choices are fabulous at a French market! Aix-en-Provence. 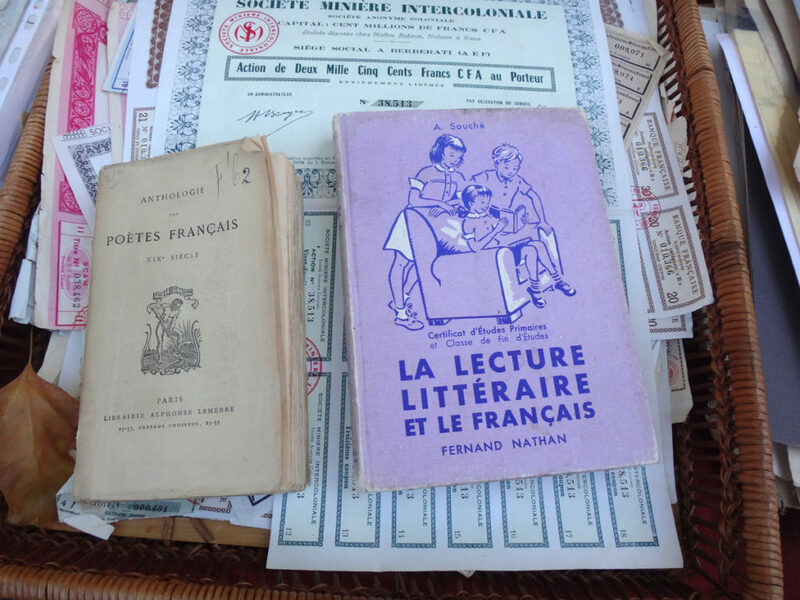 I wish I could have thought of a lovely craft for back home from the mounds of memorabilia for sale. 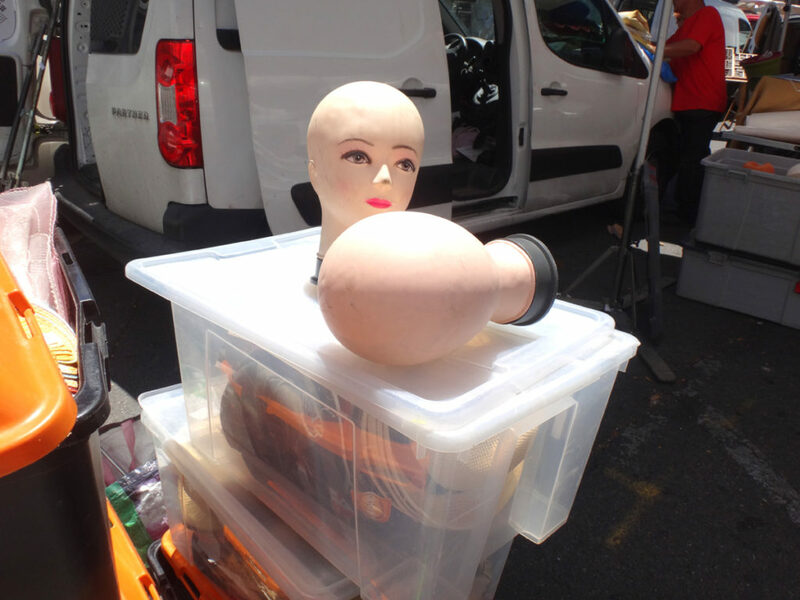 If I were a scrap-booker, this would have been in my luggage. But I’m a photographer so I snapped a photo and a memory. Aix-en-Provence. I’m betting this was once someone’s pride and joy. 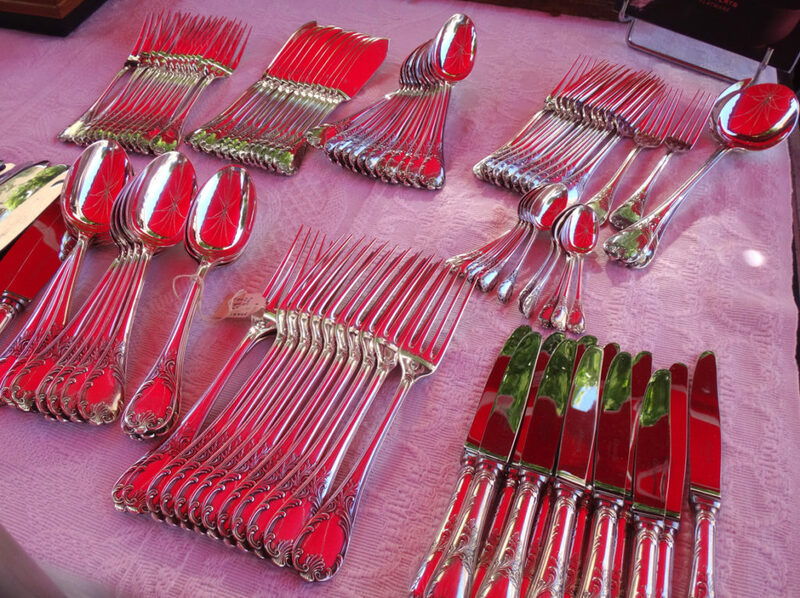 A lovely full service of French silver. 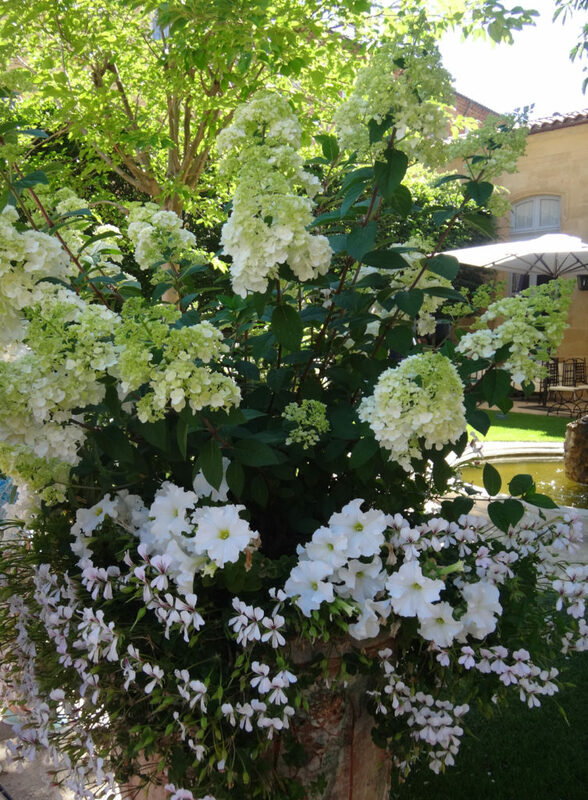 Aix-en-Provence. 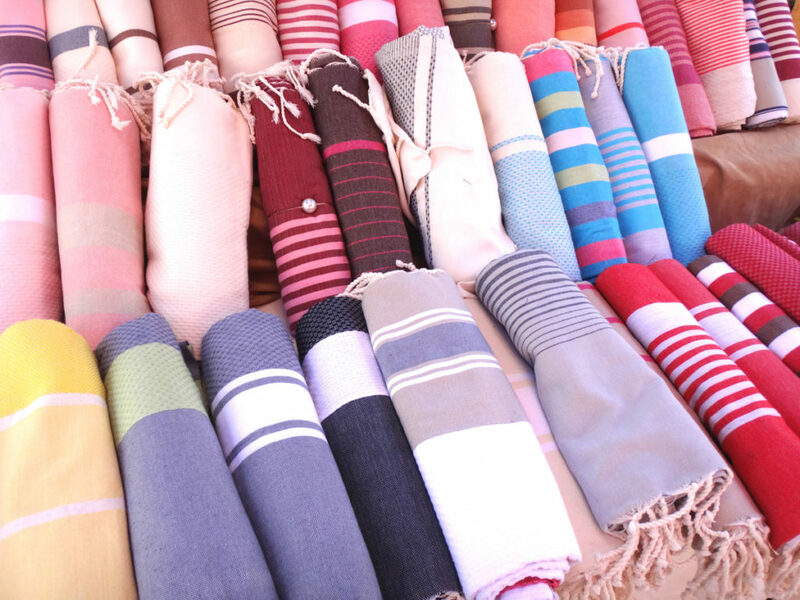 I wanted to buy every one of these luscious beach towels but once again, the thought of paying for overweight luggage held me back. Aix-en-Provence. 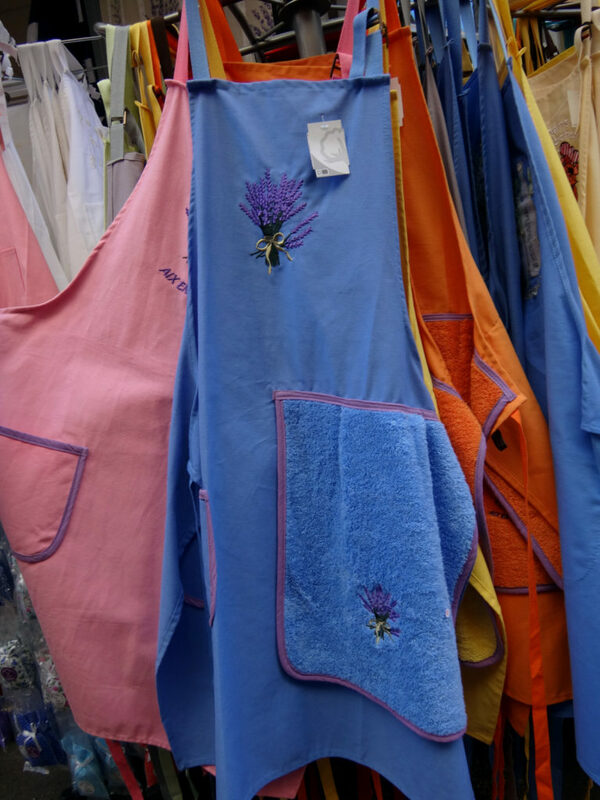 Loved this colorful display of aprons. Aix-en-Provence. We picked a landmark upon arrival so we could agree to meet there at an appointed time if we got separated. Aix-en-Provence. 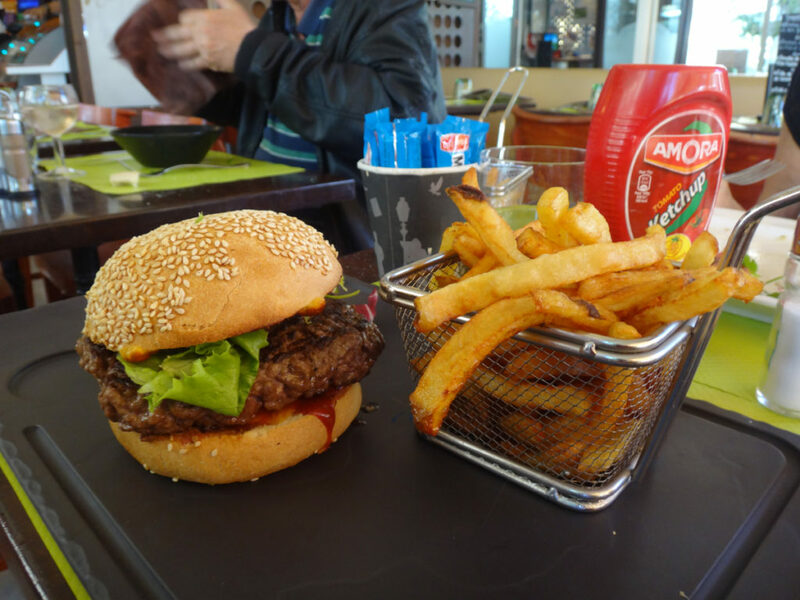 We arrived at the market hungry and bought up clusters of fresh fruits and vegetables for our home fridge, then we went in search of a cafe for lunch. 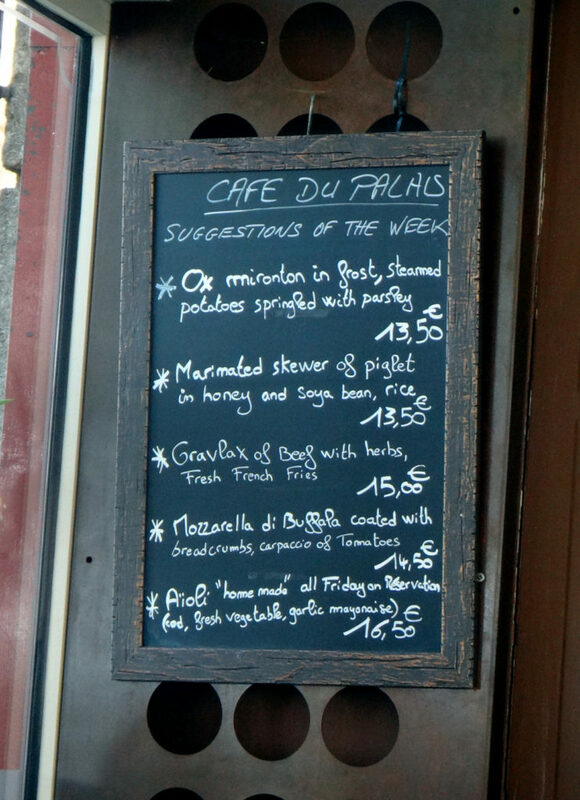 We were more than happy to discover the Cafe du Palais with its hearty lunches for about $15 plus wine. 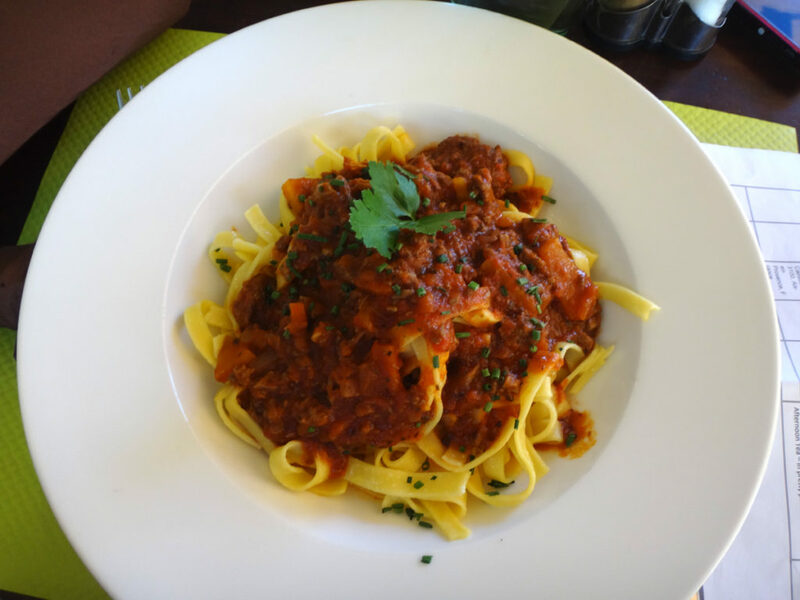 Lesson learned from this restaurant: Before collapsing into chairs at the closest cafe, take a moment to see how the servers treat the guests. If the servers look like they are going to spend as little time as possible with you because they’re Jonesing for their next cigarette break, you might be better off somewhere else. 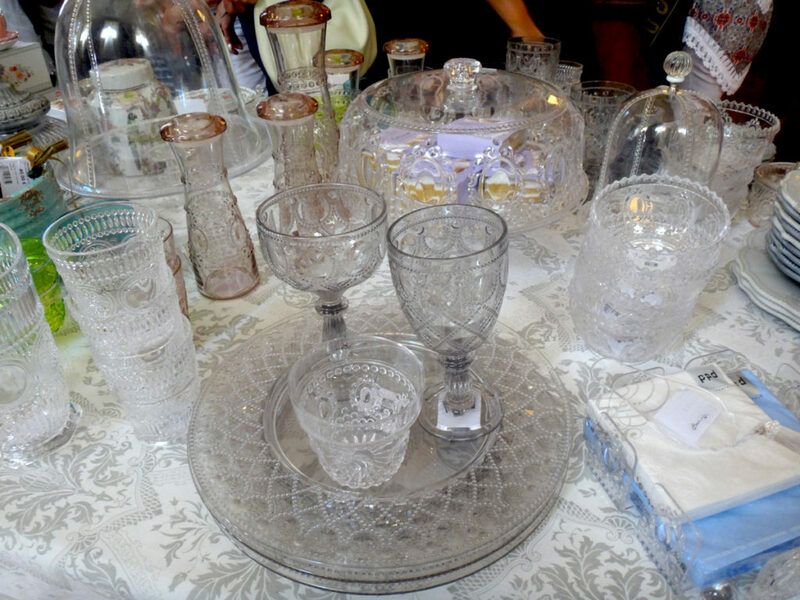 After lunch, we strolled and shopped, enjoying the windows and gasping at some of the exorbitant prices. Plaza along the Cours Mirabou. 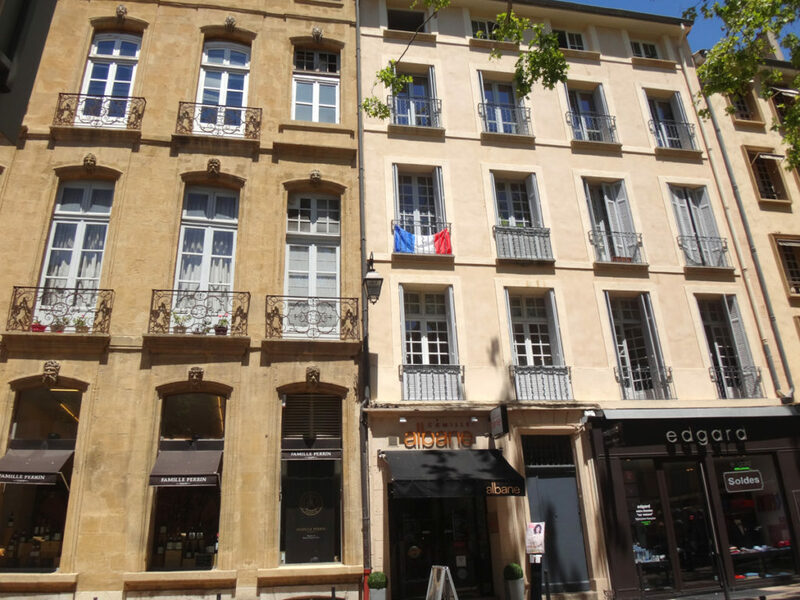 Aix-en-Provence. 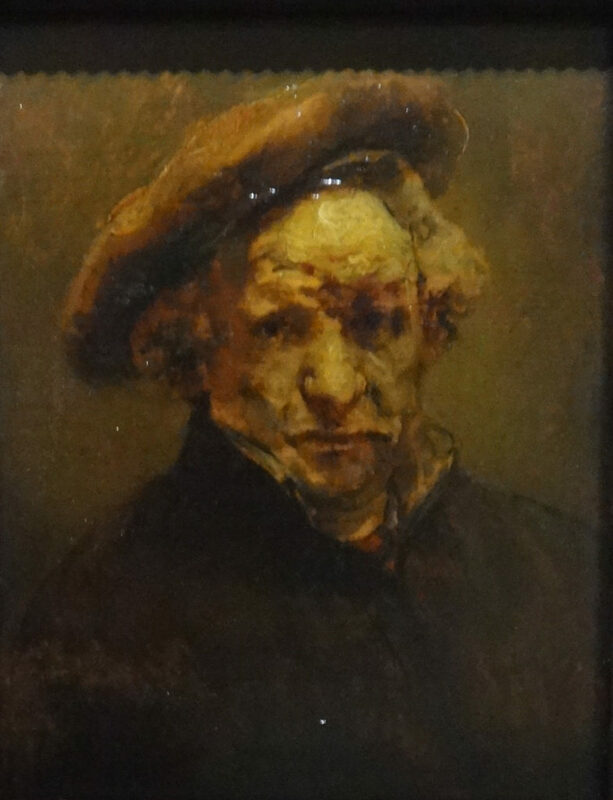 A delightful painting in the window of a gallery. The store was closed for lunch or I would have looked further into this painting. I love the whimsy and the color. Aix-en-Provence. Sher and Denise window shopping at Hermes. 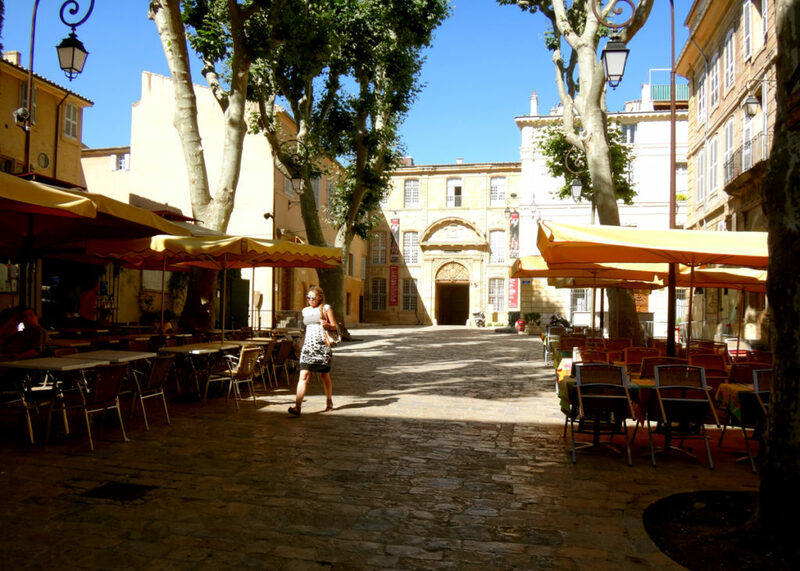 Aix-en-Provence. I love how sales are advertised. 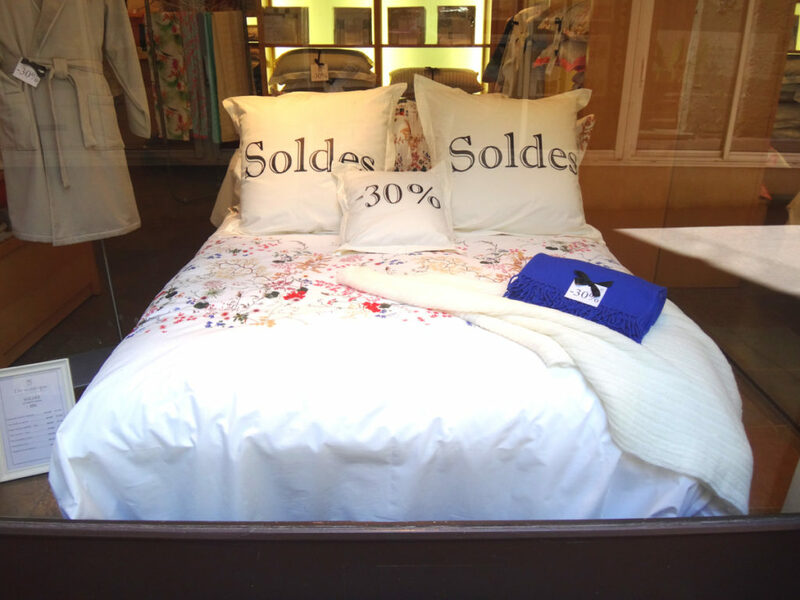 Stores often print special pillow cases, build special exhibits, leave manequins naked, or pop shopping bags over everything in the window to advertise a sale. Aix-en-Provence. How adorable is this? Matching swim trunks for dad and son at just $95 and $195 each. Aix-en-Provence. Chocolate is everywhere and D-E-C-A-D-E-N-T! Aix-en-Provence. 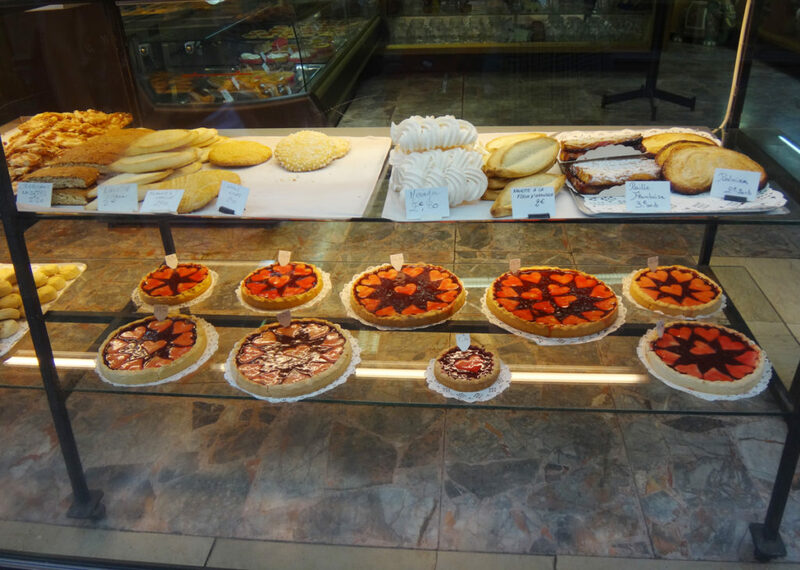 We should have skipped lunch and just gone for the tarts in the local patisserie. Aix-en-Provence. 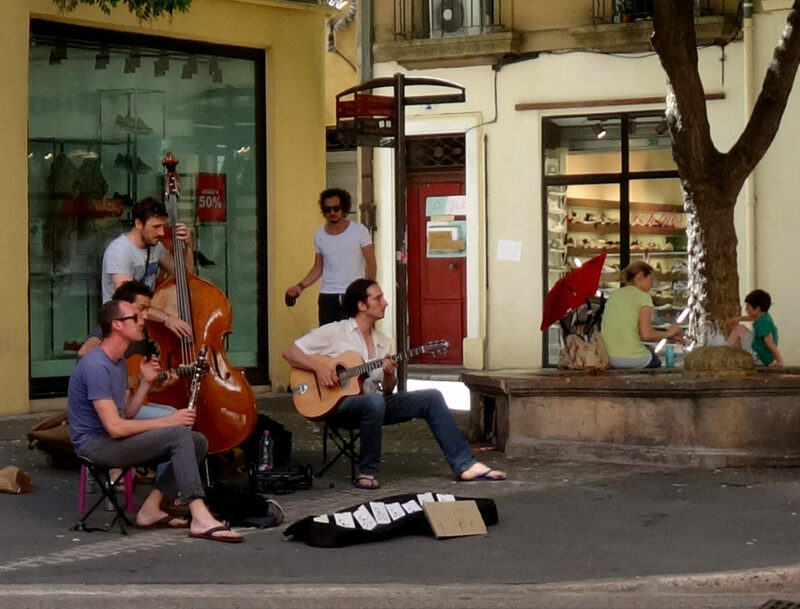 Buskers performing on a street in Aix-en-Provence. 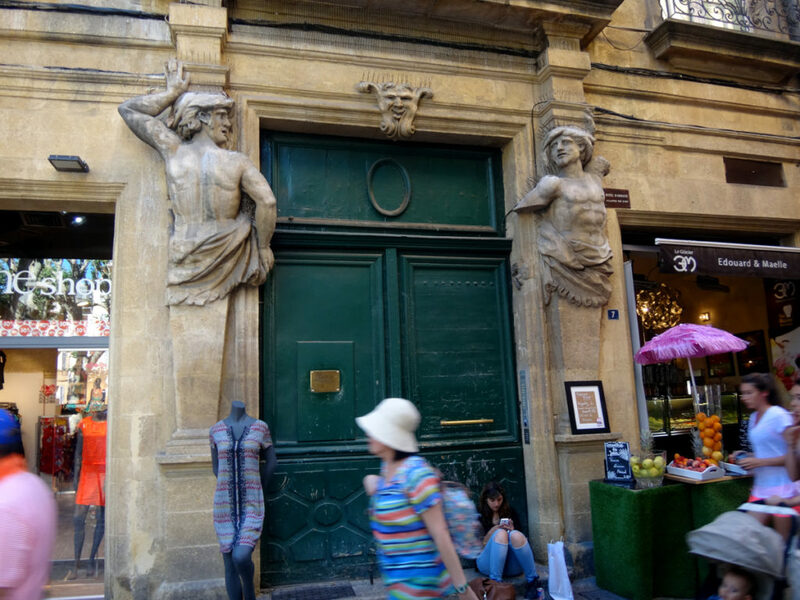 A pretty doorway in Aix-en-Provence. A churchyard. I don’t even know the name. Aix-en-Provence. Enough shopping! On to some culture. 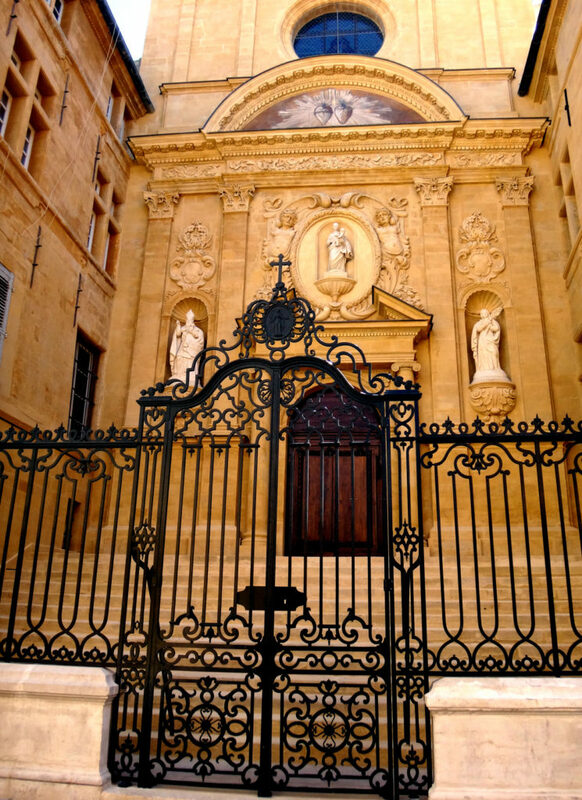 Based on collections once owned by leaders of Provence, the Granet Museum houses about 12,000 works of art in the former Palace of Malta and at a chapel down the street and around a corner. 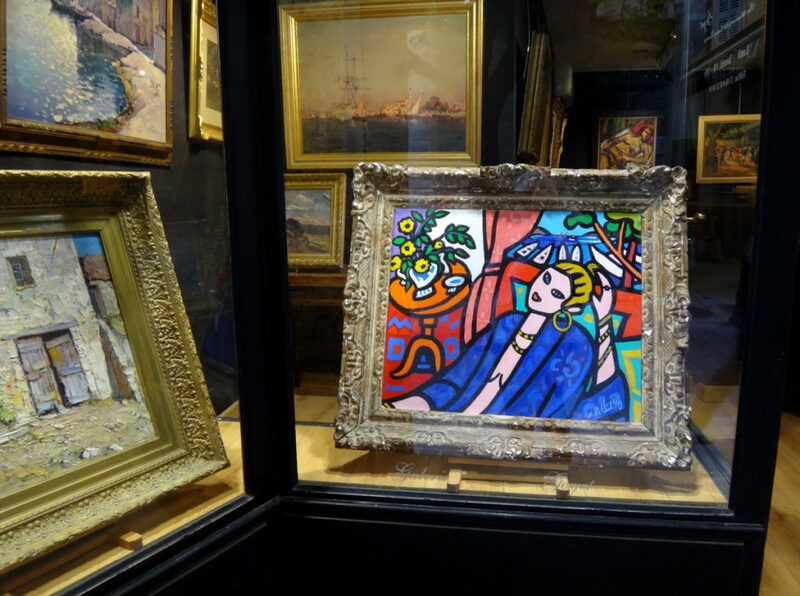 You can actually take a virtual tour of the Granet Museum on their website but these are a few of my favorites from the collection. 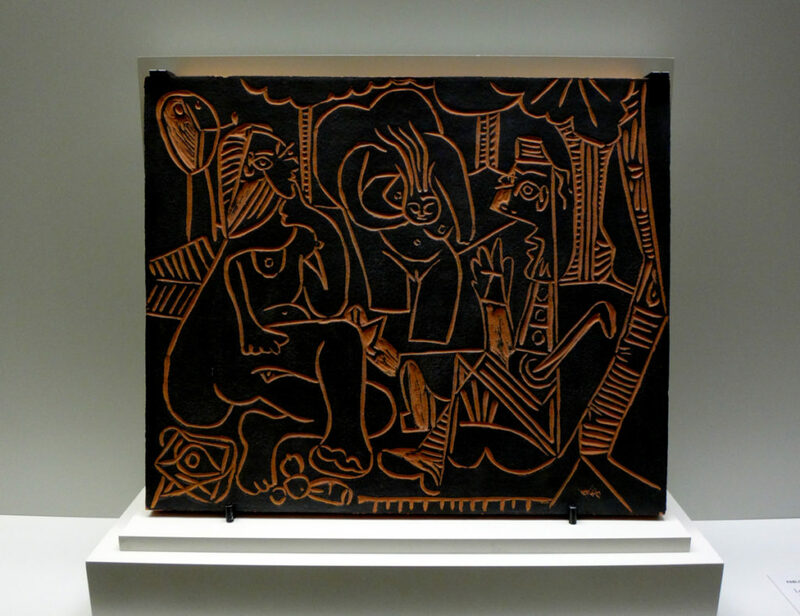 A tile called Le dejeuner sur l’herbe, 1964, by Pable Picasso. 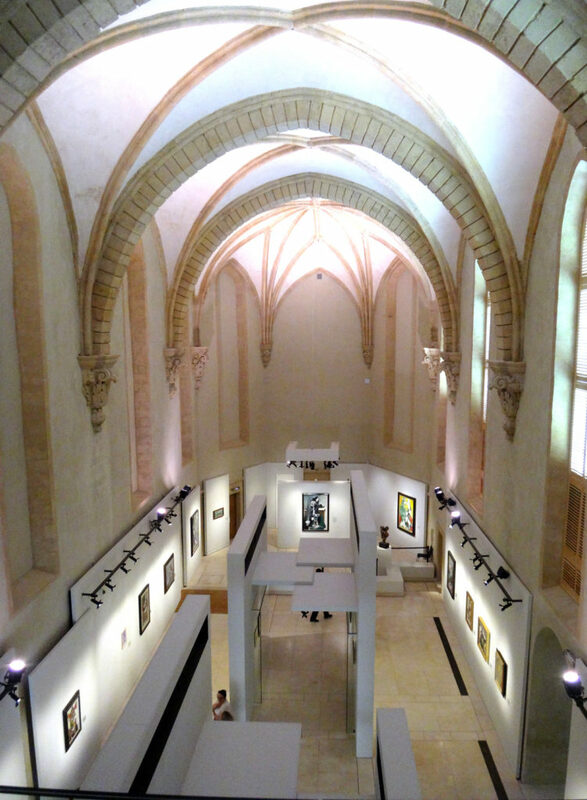 Musee Granet in Aix-en-Provence. 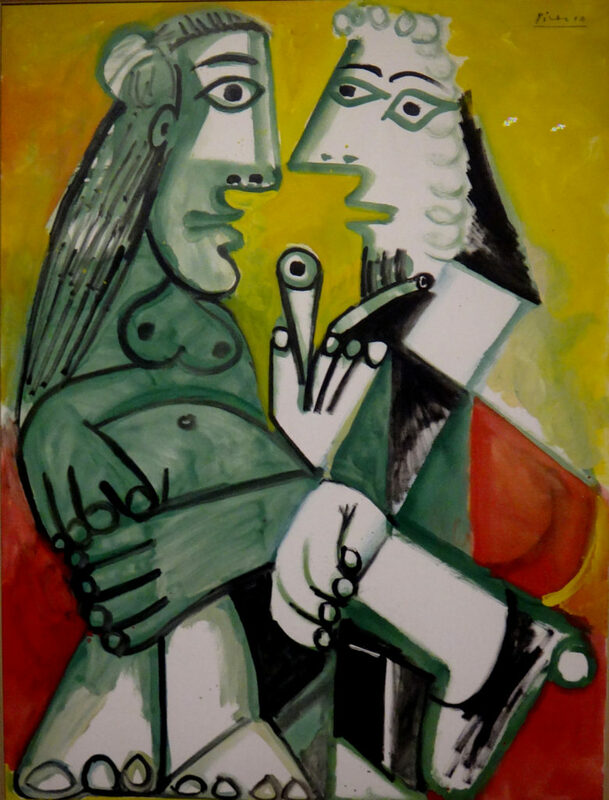 La Conversation, 1968, by Pable Picasso. Musee Granet in Aix-en-Provence. 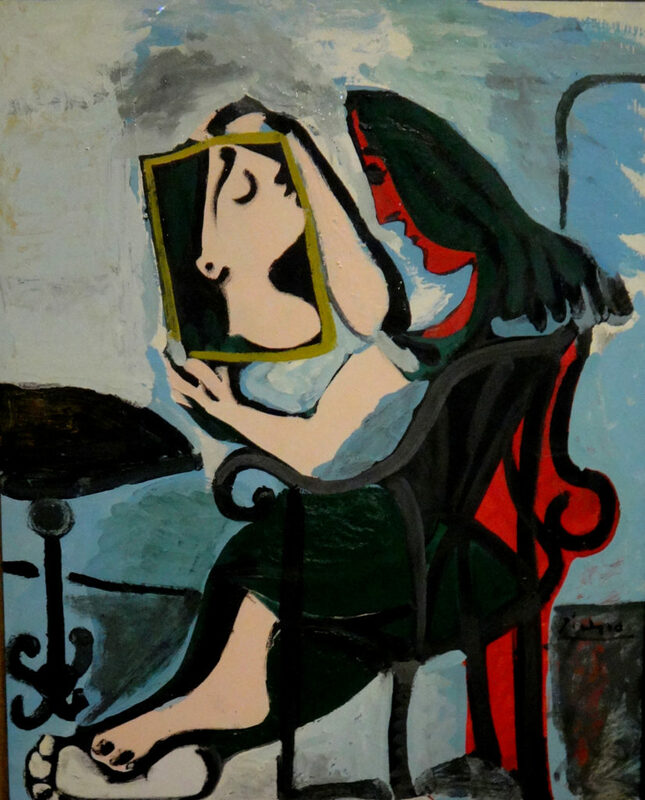 Femme au Miroir, 1959, Picasso. Musee Granet in Aix-en-Provence. Maybe I love this artwork because I had a print of it hanging in my dining room for about 30 years. I wonder what happened to it? 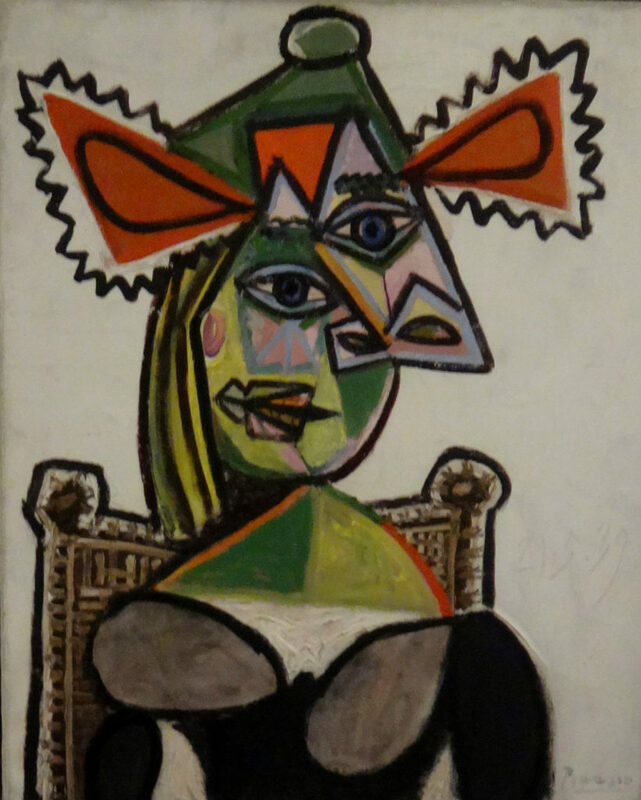 Femme au Fauteuil, 1949, Picasso. 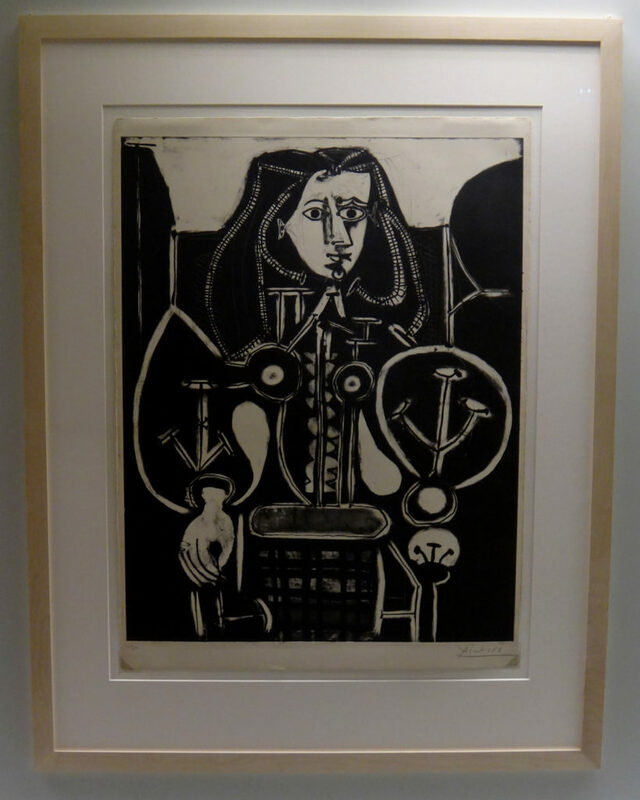 Musee Granet in Aix-en-Provence. 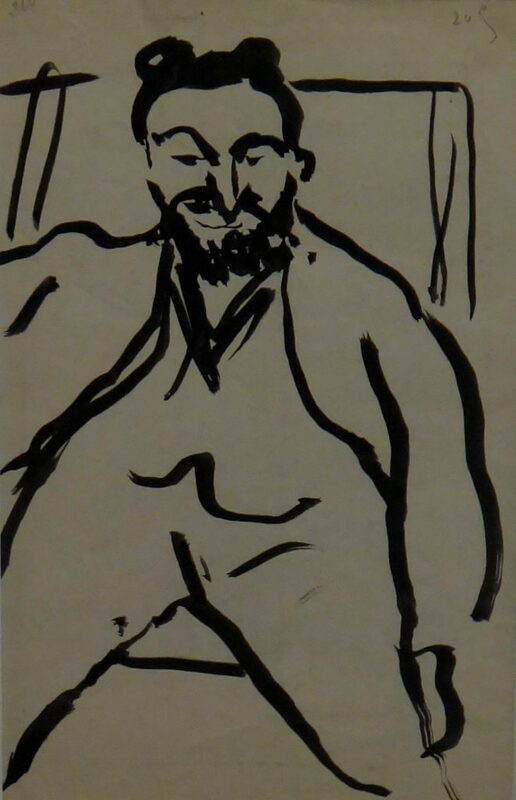 Feme au Chapeu dans du Fauteuil, 1939, Picasso. 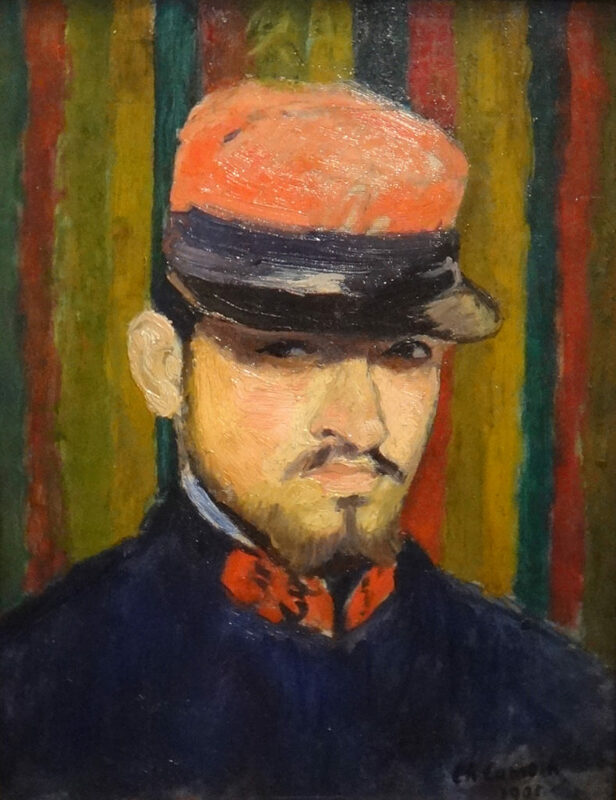 Musee Granet in Aix-en-Provence. This is the chapel where some of the art hung in a building down the street. Absolutely stunning. 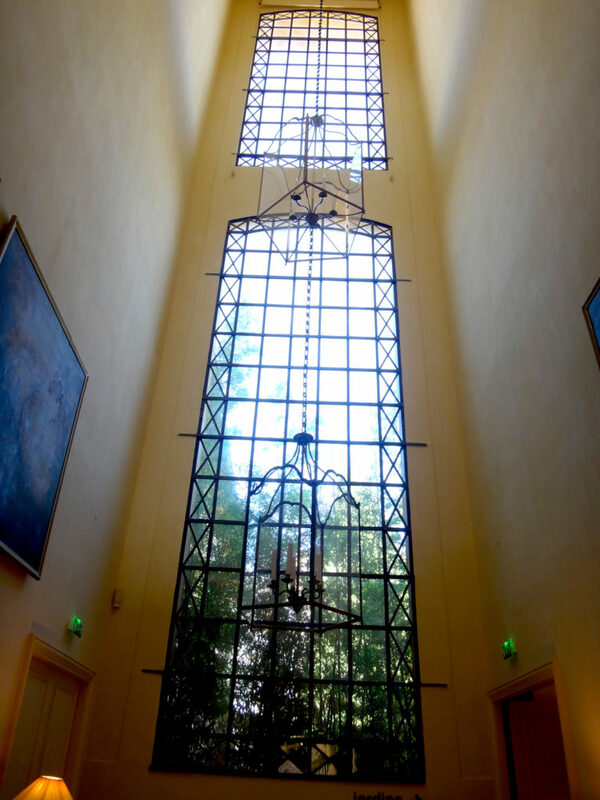 Musee Granet in Aix-en-Provence. 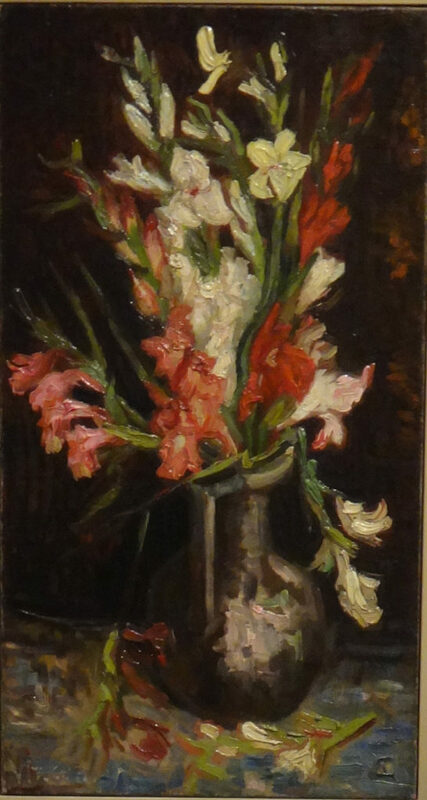 Bouquet de Fleurs, 1886, Van Gogh. 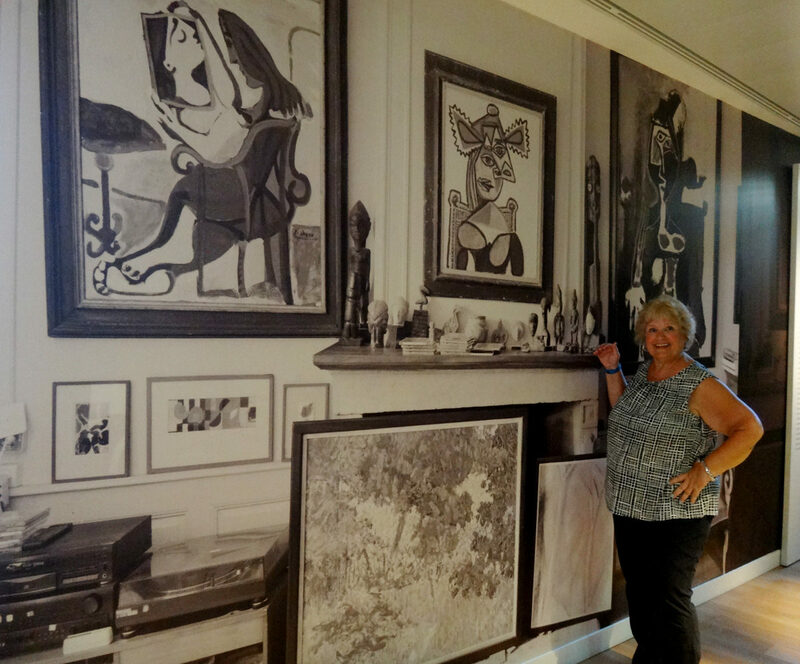 Musee Granet in Aix-en-Provence. 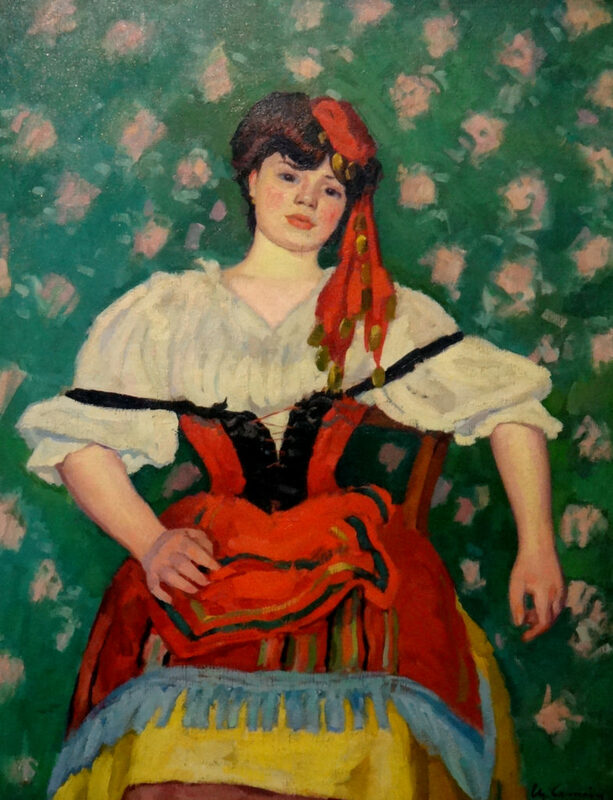 Les Tartaines, 1925, by Charles Camoin. 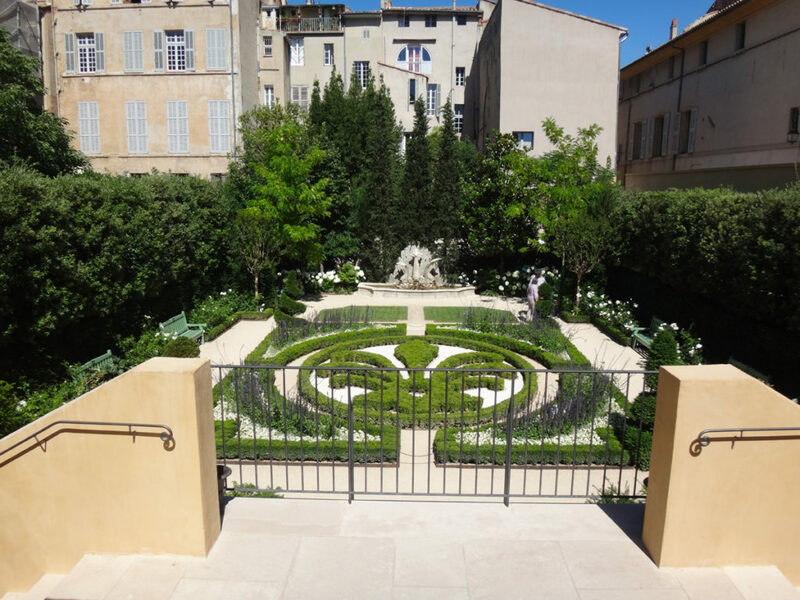 Musee Granet in Aix-en-Provence. 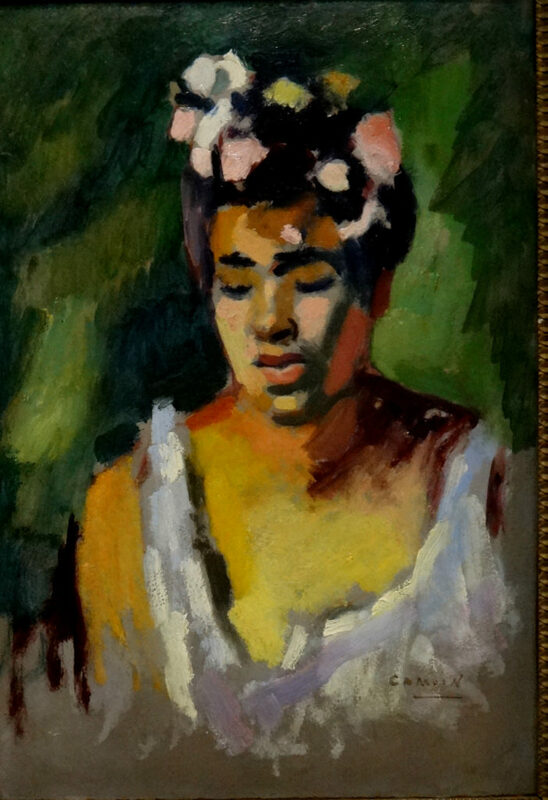 Cezanne is the star of Aix-en-Provence but the Granet displays just 10 paintings and owns another dozen, not displayed. 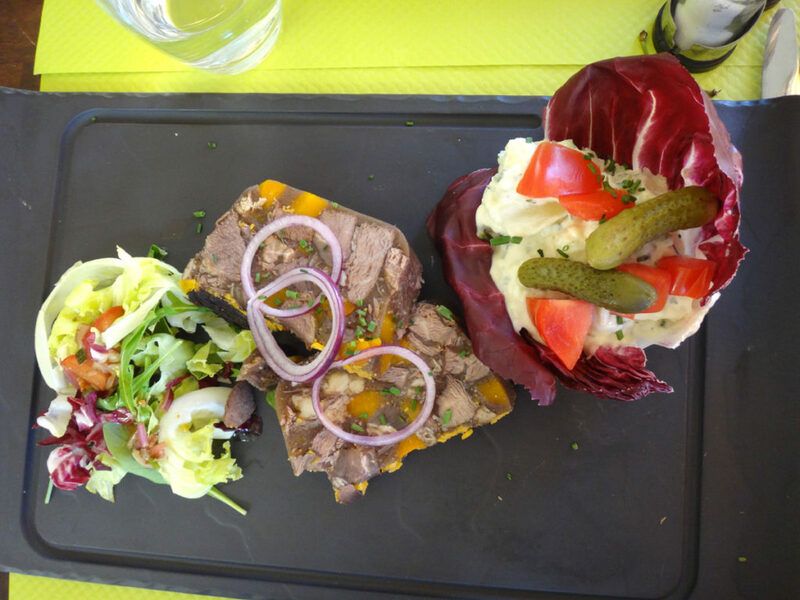 Still, restaurants and shops are named after the all-star impressionist and you can see metal plaques capping cobblestones throughout town where Cezanne once painted. The capstones lead from the house where Cezanne was born to St. Jean Cemetery where he was buried. 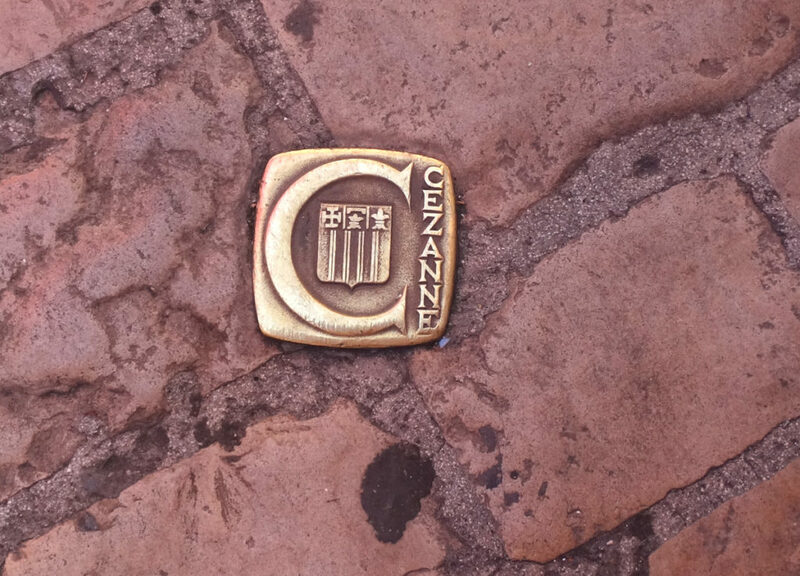 Plaque in the cobblestoned streets of Aix-en-Provence. 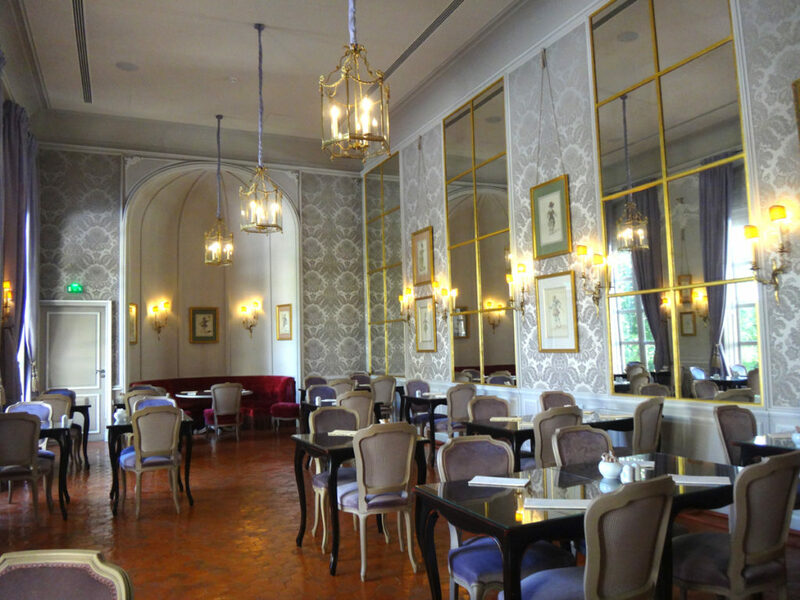 The Caumont Center for the Arts is recommended for its elegant tea room but the place is extravagently expensive. We stopped in for for a cup of tea and a dusty-looking pastry only to be shocked when we were charged twice as much for the “tea of the day”. Two cups of tea and a bottle of water came to just under $30. Service was very poor and we had to track down a server to take our order. They simply could not be bothered to bring us our check and we had to find a manager to help us with that. 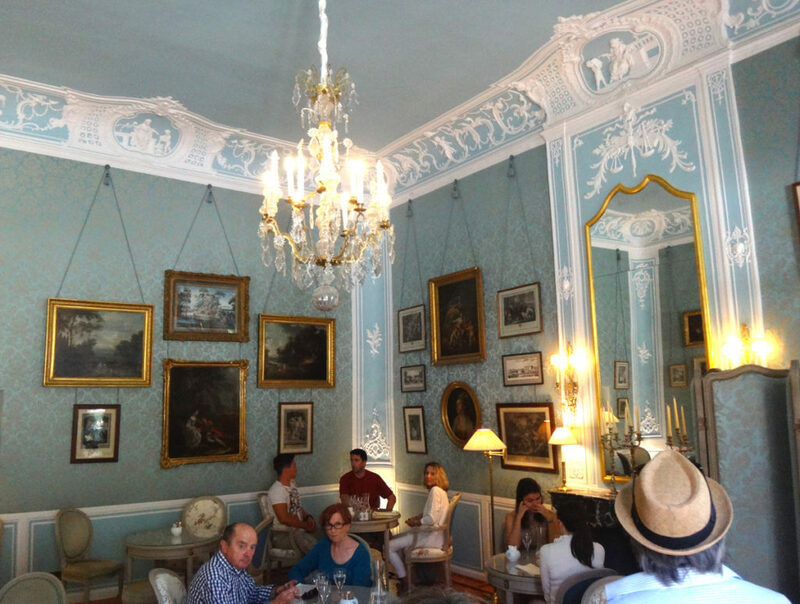 Luke-warm tea and a close and humid room on a hot, sunny day contributed to the discomfort and rude atmosphere in the beautiful tea rooms. 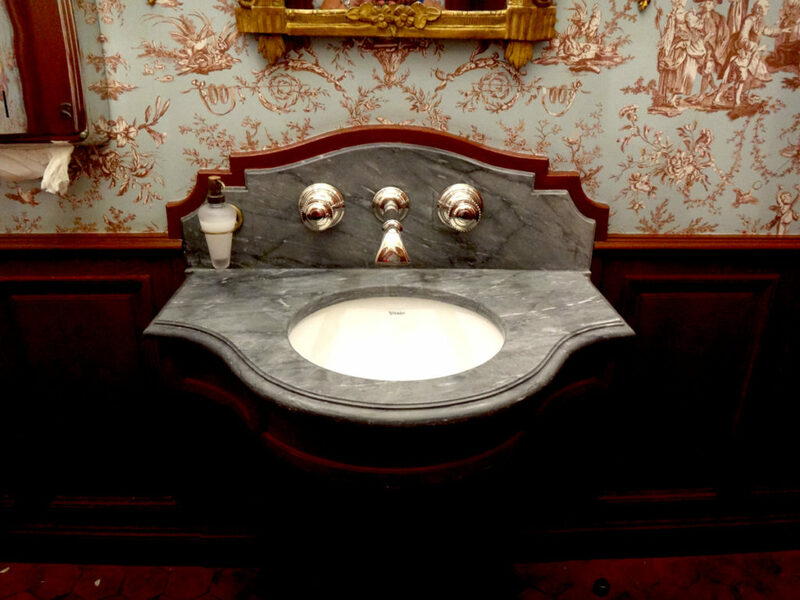 The restrooms were the real treat at the Caumont. We avoided the lower-level restrooms and used the first-floor toilet tucked into a small passageway near the outdoor formal gardens. 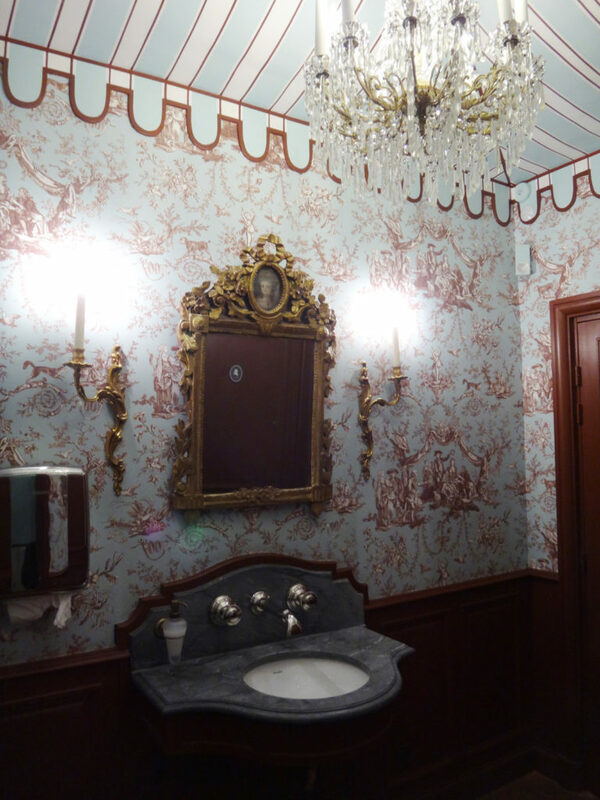 Best restroom in all of France! 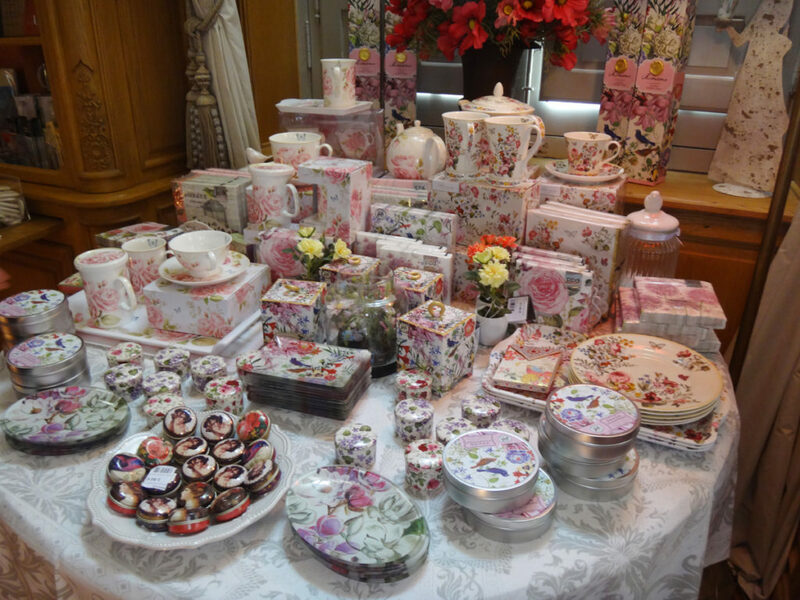 The gift shop is another delight. 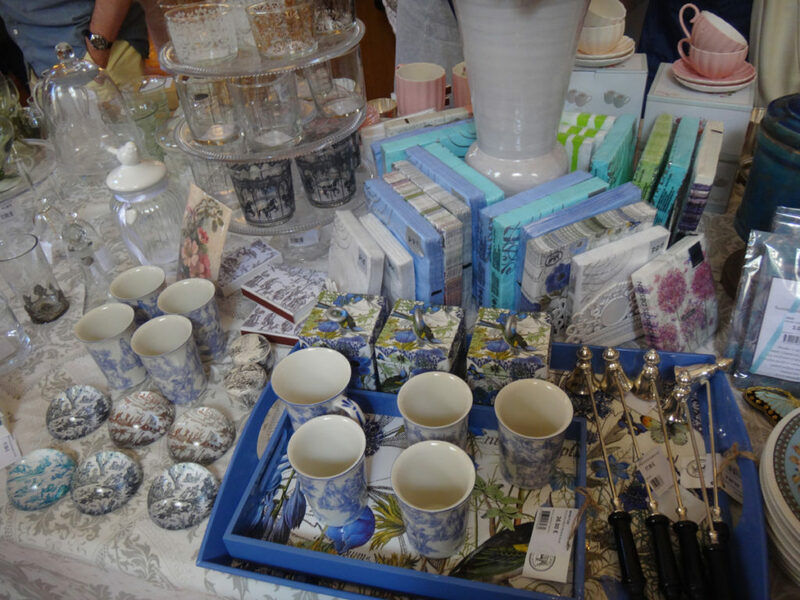 Tables are elegantly staged and everything is for sale. 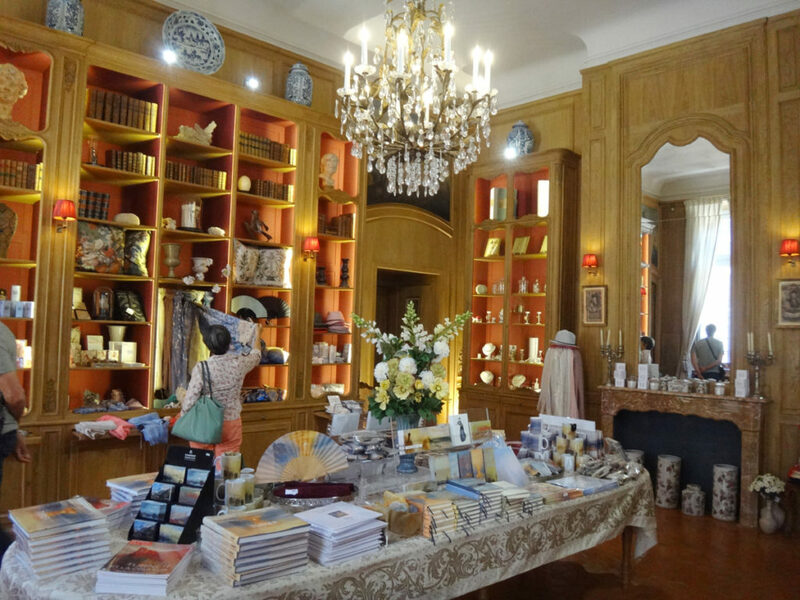 The gift shop at Aix-en-Provence Caumont Centre de Arte. One of the feature windows. Aix-en-Provence Caumont Centre de Arte. 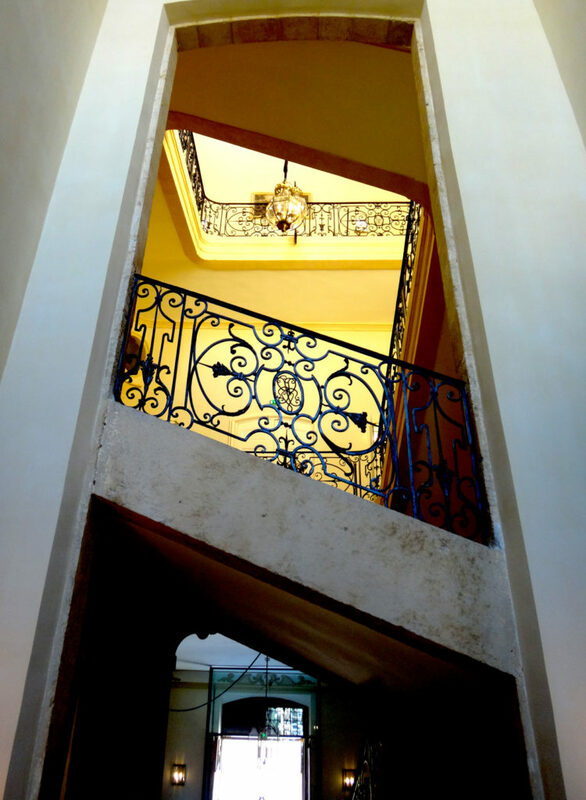 The stairwell. 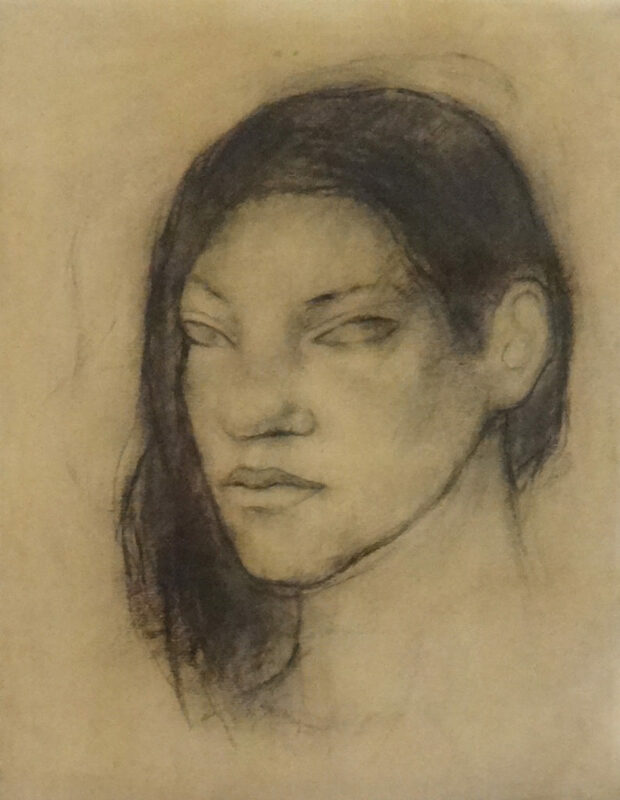 Aix-en-Provence Caumont Centre de Arte. 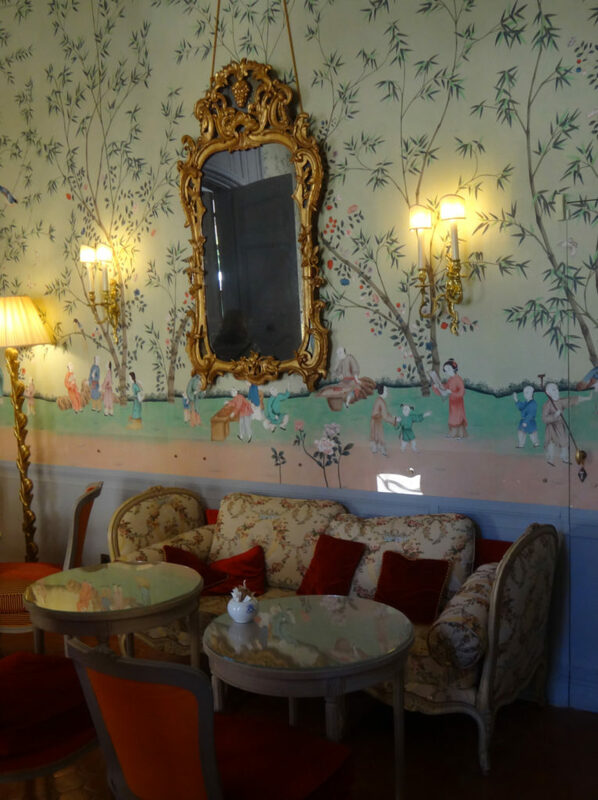 So my advice for the Caumont is to peek in the tea rooms – but don’t bother eating – tour the verdant gardens, enjoy the gorgeous gift shop, and leave with lovely memories. The Cathedral of the Holy Saviour of Aix-en-Provence was built atop an ancient temple to the sun gods on the Via Aurelia, the Roman road built through the south of France. 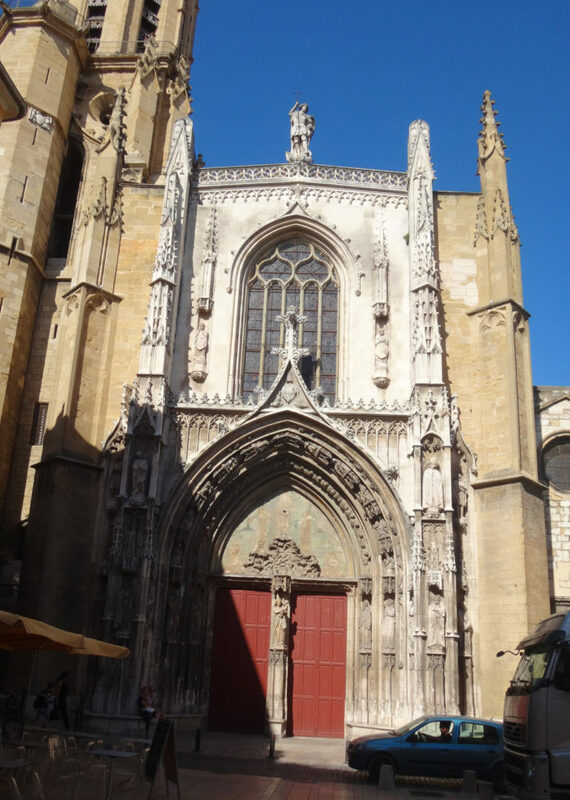 Begun in the 1200’s when Aix was the capital of Provence, the cathedral was completed just about the time Christopher Columbus was discovering America in 1492. 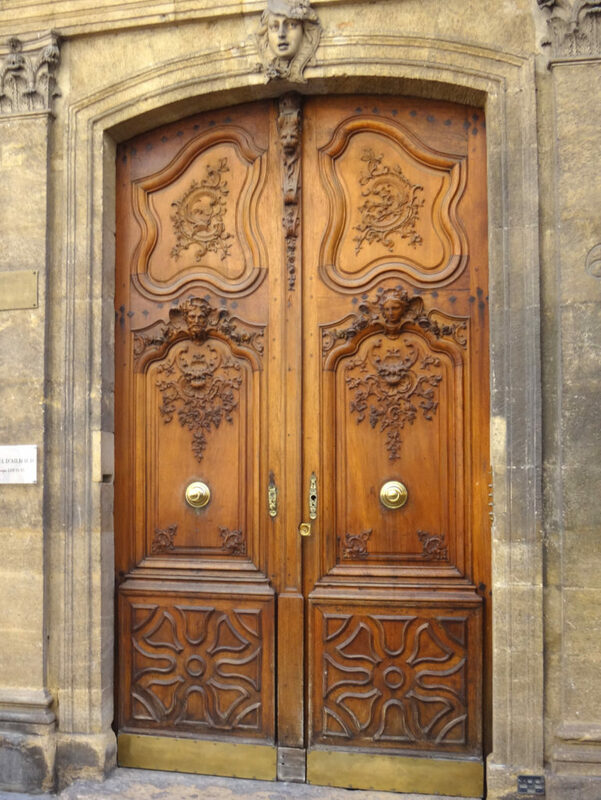 The carved doors to the cathedral are made of wood and were commissioned in the early 1500’s. You can see the four old testament prophets surrounding the doorway and a dozen pagan fortune tellers above – they foretold the birth and death of Christ. 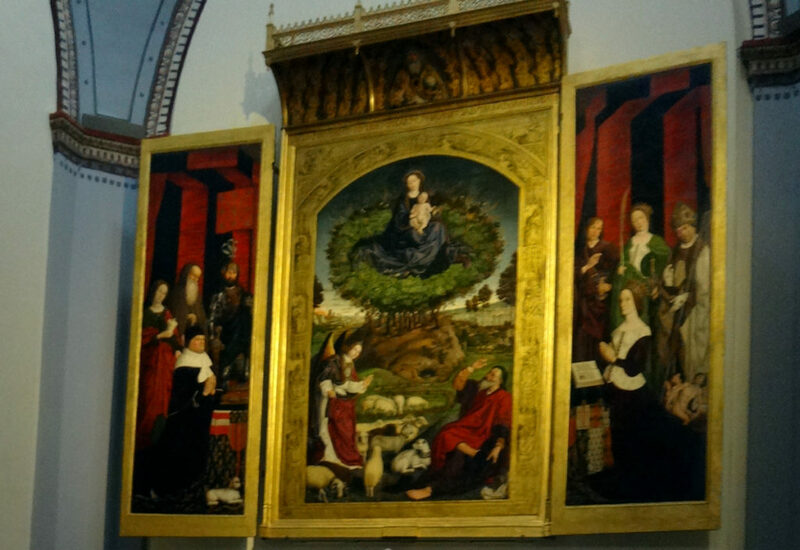 The altar piece painting is a masterpiece of the 15th century created by Nicholas Froment of nearby Avignon. Moses, guarding his flock, is astounded to see Jesus and the Virgin Mary rise from a burning bush. I’d also be pretty surprised if it happened to me. The people painted in the left and right panels are the folks who paid for the painting, King Rene (left) and Queen Jeanne (right). This is an altar built by Audinet Stéphani for the Aygosi family. 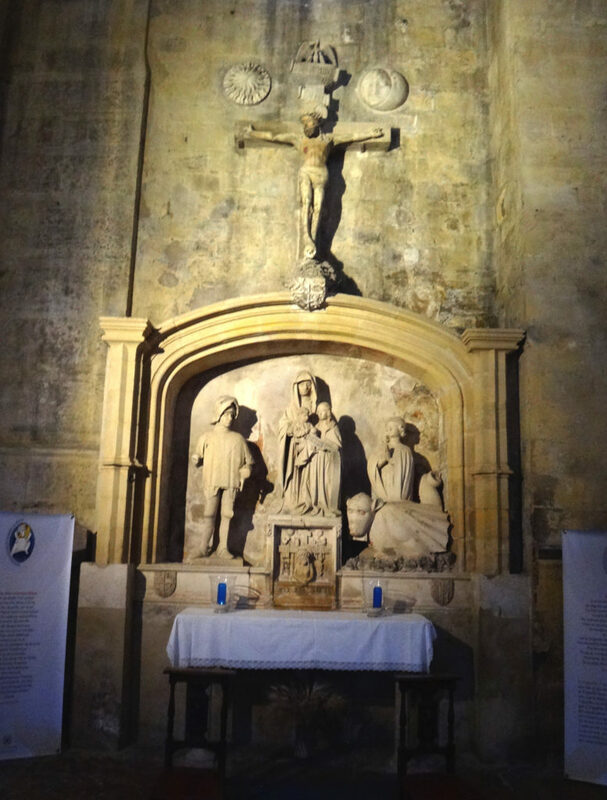 It used to be in a Carmelite church that burned down in the French Revolution so it was moved to the cathedral along with the altarpiece, above. You can see Saint Maurice in his coat of armor to the left of St. Anne, the mother of Mary. 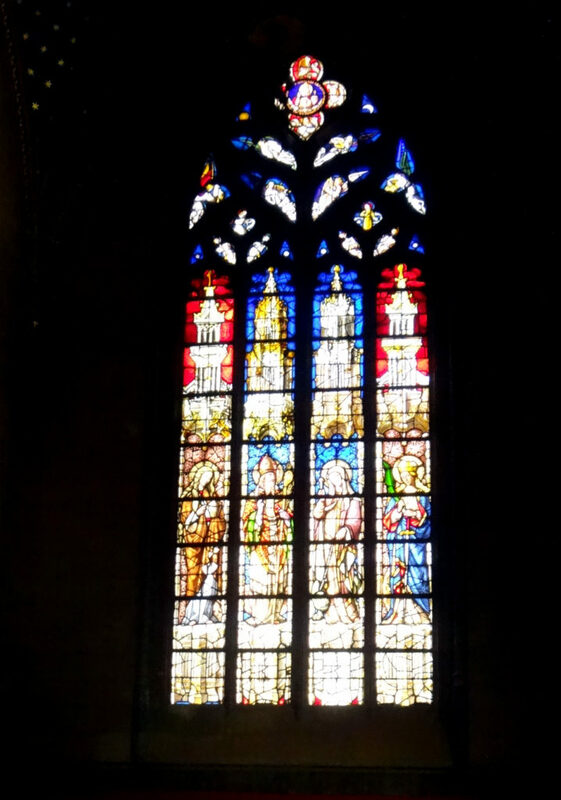 I’m a fool for stained glass, and while I have no information, you can see that the window tells a story. Looks like maybe its the story of the female icons of the church, complete with a dog symbolizing loyalty. At the end of every day in the south of France, we leave tired, happy and full of new memories. We take photographs of the parking garage and the cross streets where we left our car earlier in the day so we can find our way back. This may be the most important tip I give you in my blog! Simply pop your ticket into the machine located somewhere near an entrance to the garage and pay with your credit card. Your ticket will be validated and you can insert it into a second widow-height machine as you drive out of the garage. 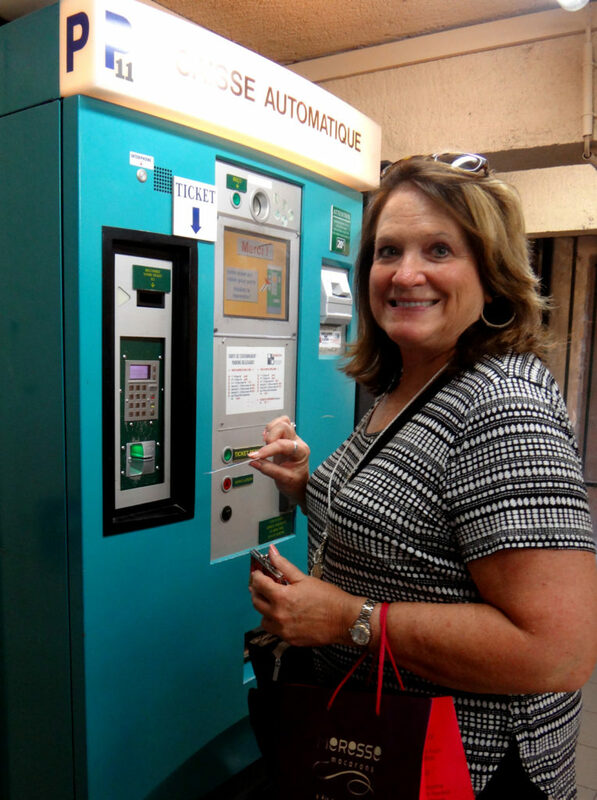 Sher pays the parking fee for our car in a garage in Aix-en-Provence. 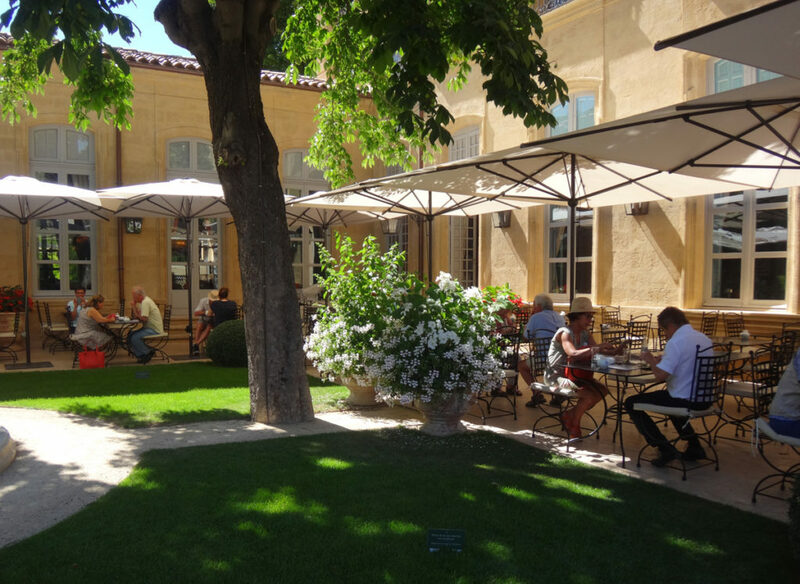 Have a great day in Aix-en-Provence. Just eat somewhere else. 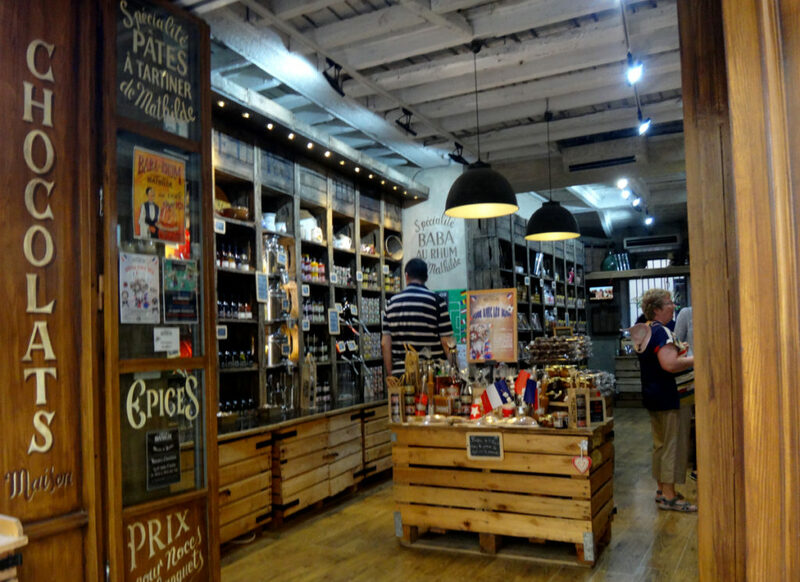 You have done an exceptional job capturing the cultural details of our Provence trip! Thanks so much, Barb! What a wonderful reference for anyone traveling here or anywhere you have been. 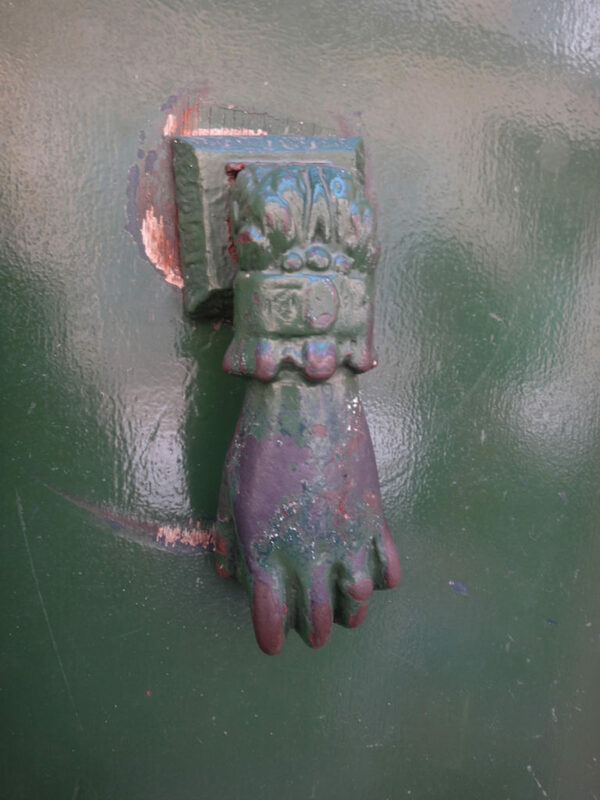 Next Next post: Doesburg, The Netherlands – Go for the mustard!